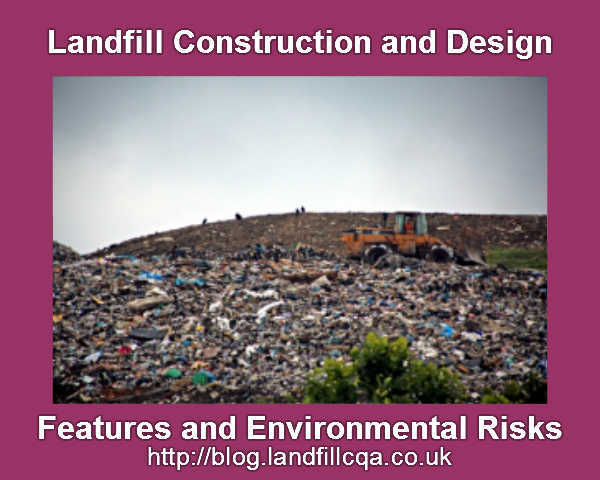 So, what are the main features of landfill construction and design? It is a question those who show an interest in their local landfill, often ask. We set about answering the question here. A garbage dump, or landfill, is normally developed by infilling a depression in the ground, such as a quarry, or a valley, and that is used for depositing wastes. In more and more cases, now that most quarries are becoming filled-up, it is developed over the ground, when it is often called a land-raised landfill. When what is known a the available the site air gap (or waste void) ends up being full, it must be covered with a reduced permeability membrane layer to shut out as much water as feasible, or else rains which percolate into the waste will certainly accumulate in it, and become what is known as “leachate”, and the mucky-water level will slowly rise and the landfill will certainly begin to “leak”. This is when ‘garbage juice’, which is more correctly referred to as leachate, can escape. Leachate is a highly polluted water, as especially dangerous to the environment and it must be carefully considered during every landfill construction and design stage. If leachate enters a stream or canal/river it may kill the fish life and several various other microorganisms also. Consequently it is extremely is important making certain that the land-fills in a city or state do not become ruptured, or leakage will occur. Nature then has little defence, since the watery waste will almost certainly discover its way back into the city’s groundwater supply. A lot of garbage dumps consisting of organic products will produce methane, and lots of it, which is bad news for carbon emissions, as methane is a big contributor to climate change gas emissions. All plants in Europe now need to be analyzed under the requirements of the EU ATEX Directive as well as explosion risk zoned, wherever explosion risks are identified. This is to avoid future fires, flash-overs, and even explosions. The most important need is the prevention of the discharge of liquefied methane from untreated leachate into public drains, as well as the majority of sewage treatment authorities limit the permissible discharge focus of dissolved methane to below an explosive limit. If the garbage dump gas removal rate is abundant enough, a gas generator or internal combustion engine can possibly be utilized to make power to market commercially or use on website. Waste is delivered to the landfill site by covered trucks each weighing-in 13 tonnes or more of rubbish at each visit. Throughout all landfill procedures the waste collection vehicles are evaluated at a lorry scales or “weighbridge”, on arrival and also their number plates are recorded, and each load is examined for wastes that do not accord with the landfill’s waste acceptance standards. Later, the waste delivery trucks utilize the already existing landfill site road network on their way to the tipping face or working front where they discharge their contents. After loads are transferred, compactors or bulldozers are used to spread as well as compact the waste on the functioning face. Prior to leaving the landfill limits, the waste automobiles go through a wheel cleansing facility. If required, they return to the weighbridge in order to be evaluated for the unloaded truck’s weight or “Tare”, without their loads. Through theÂ process, the everyday incoming waste tonnage can be computed as well as listed in databases for document keeping. In addition to vehicles, some garbage dumps are supplied with their waste by goods trains. These sites are designed for this from the start of the landfill construction and design stages and are geared up to take care of railroad containers, unload them and reload them for re-use. Making use of ‘rail haul’ permits landfills to be situated at farther distances from cities, without the troubles related to long truck journeys. Land fills can be considered as feasible sources for the future of rare materials, as well as a mother lode of materials in addition to landfill gas energy, as previously stated. In the emerging developing nations of the world, waste pickers commonly scavenge every day for those still functional materials, which can be used for recycling. In a business context, land fill sites can sometimes be more profitable to run as gas recovery establishments, rather than as waste sites. Various other waste management business facilities have included waste burners which have integrated water heating (CHP) systems. In older land fills the landfill construction and design was less advanced, and in those without any membrane layer in between the waste and also the underlying geology, leachate is able to easily leave the waste, and when it does it may at some landfills, circulate directly into the groundwater. In such instances, there then becomes a high focus, during the landfill construction and design stafes, on whether leachate is emanating as pollution in nearby springs and also during rainstorm flushes. As leachate first emerges it can be black in colour, anoxic, and also perhaps effervescent, with liquefied as well as entrained gases. As it ends up being aerated it tends to turn brown or yellow due to the presence of iron salts in solution as well as in suspension. Much more modern-day garbage dumps in the industrialized globe have some form of membrane layer separating the waste from the surrounding ground, and also in such solid waste infilling sites there is usually a leachate collection system which comprises a series of pipelines positioned above the membrane, with pumps fitted to transport the leachate to a leachate collection or treatment area.